I’ve been married for nearly 10 years now. In that time, my husband and I have lived with my mother, barely scraped by on one paycheck, lived below our means with two decent incomes and flipped back to being one-income earners. All of which is to say, we’ve had a lot of practice talking about money and all the ways we deal with finances in our relationship. To be clear, we’ve also had our share of arguments and hurt feelings over money too. When we first got married, I was the textbook saver and he leaned toward being a spender. I wish we’d had better resources to know not just how to budget, but also how to talk to each other about our budgets so we’d have been better able to understand where the other was coming from. We certainly weren’t alone in our struggles. A February 2017 study by Ramsey Solutions found that money was the No. 1 issue couples fight about. The study also found that money arguments were the second-leading cause of divorce, behind infidelity. Why is it so hard to talk about money? “I think one of the big reasons is that we equate our self-worth with our net worth,” says Ashley Feinstein, life coach and owner of The Fiscal Femme. When we believe our debt or our ability to budget makes us good or bad people, we’re less likely to share where we’re struggling or what we value. And that’s really what money is in many ways: an allocation of values. The good news is these can be excellent low-stakes places to start conversations about cash flow and begin to learn the ways to deal with finances in your relationship. Talking about your goals and plans for the future, even the ones that don’t necessarily seem to be tied to your investment plans, can be an easy entry point. Germano, for example, found herself having to have a conversation with her partner early on because he was more of a spender than she was, and she found herself coming close to missing her own personal goals trying to keep up with his spending. “Get on the same page about how often you want to go out to eat or travel so that one person doesn’t feel overwhelmed by the spending or intimidated or even resentful,” she says. 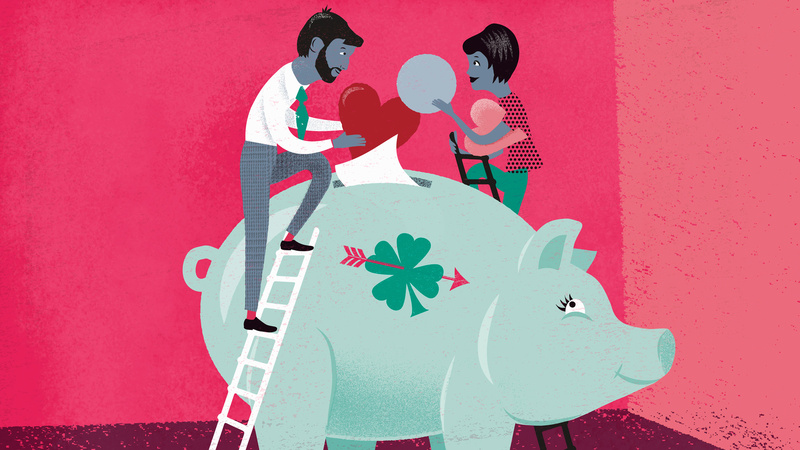 When to start merging accounts is, again, dependent on the couple — though your finances are most likely to start getting tied together when you share a living space or get married. Or you might have a joint goal you’re working toward, like saving for a vacation. Once you’ve decided you want to start merging your money together, if you haven’t already, start to share your own financial background and ask about theirs. Any debts the two of you have, Germano says, should be out on the table, as well as how much each of you makes every month. You should also share the details of the money going out every month, like gym memberships or subscription services. There’s no right way to split accounts or set up a budget. You may decide to share one account, have totally separate accounts or some mixture of the two. The most important thing, according to Feinstein, is accountability: someone needs to be checking in on the accounts to be sure you’re both staying on track. Beyond that, you probably already know how to make a spreadsheet and figure out what your fixed expenses are. Once you’ve tracked expenses and set goals for future spending, Feinstein recommends having recurring “money dates,” preferably every two weeks, to review spending and see if the budget is working for both of you. If it’s not, ask questions. Was it a one-off issue, like increased transportation costs because of bad weather? Was it too restrictive? Did it bring up negative feelings? The money dates, Feinstein says, should be fun, so try to keep them light. Be especially aware if you find yourself falling into one person acting as a kind of disciplinarian over the budget. The point is to stay open and honest, not to judge. “The whole point of having that conversation is to avoid any drama, to avoid any judgment and to get your cards all out on the table,” Germano says. Both Germano and Feinstein say they also saw a lot of value in having separate pools of money, whether they were in separate accounts or otherwise, that could be spent at each person in the couple’s discretion. “I definitely am a proponent, especially for women, to keep their own stash of money in their own spending account, and that’s really because if you’re earning money, you should be able to spend it,” Germano says. Of course, she says it has to be within reason. Feinstein has an easy way to set expectations for what “within reason” means. Ultimately, working out how you want to spend your money as a couple should be a positive thing.